What is with these professors that have taken over academia with their ridiculous ideas? Nobody cares what they think about anything and yet they spew garbage from their mouths daily. Fox News host Jesse Watters debated one of these moonbats over the weekend who claimed that eating meat is part of “toxic masculinity,” whatever that means. Oh, she is going to tell us what that means, should be a fun time. Watters certainly had fun in the debate. Anne DeLessio-Parson, a Ph.D. candidate at Pennsylvania State University, claims in her academic papers that meat eating is something that reinforces the patriarchal society that we live in. Let’s hope she never gets that Ph.D. I don’t want her corrupting the minds of our children. She said that vegetarianism is a part of feminism after living in Argentina as a vegetarian. That’s a shame because I have lived in Argentina and they have some of the most delicious meat I have ever tasted. Watters did the only thing you can do with these kinds of people – make fun of them to their face. He wanted to know exactly how eating meat perpetuated the oppression. Eating meat is “one of the ways … to reinforce existing social structures, including patriarchy,” DeLessio-Parson claimd. Watters asked her to elaborate and she said she didn’t have enough time to do so. Look pumpkin, there are plenty of podcasts you can go on to defend your indefensible position. I’m sure Joe Rogan or Jordan Peterson would love to have you on and laugh in your face. What a cowardly answer. She said all human decision are political, so eating meat has to be associated with patriarchy. Barf, get a life lady. The crowning moment of the segment was when a producer walked onto the set with a huge steak on a plate and set it down in front of the two. 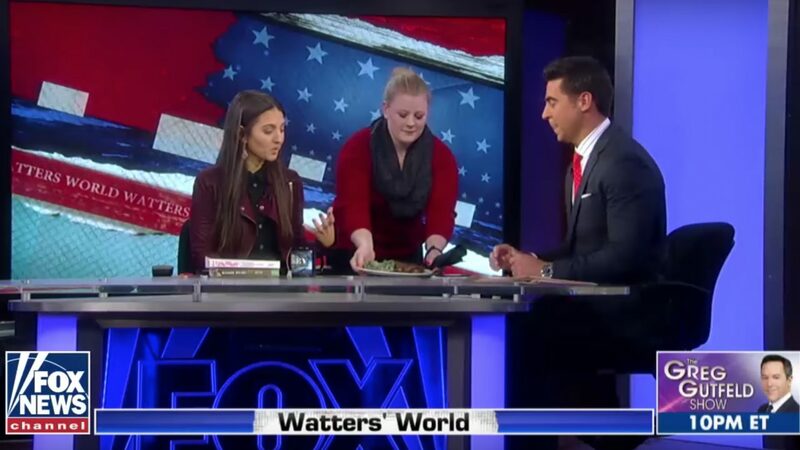 Then one of Watters’ producers walked on set and laid a plate with a fat, juicy (rare) steak on the table in front of DeLessio-Parson. DeLessio-Parson explained that eating meat is only acceptable if you have hunted the animal yourself. “You just enjoy the benefits and the blood is on someone else’s hands,” she explained. So, the people who kill the animals are fine to eat them and they don’t have blood on their hands? See how stupid this sounds? So, is it only okay to eat plants if you have planted them yourself? What a moron. “And that’s not very fair,” she explained. “It would be great if we had universal health care for our animals.” Wow, she has gone off the deep end. She hit all the talking points. She is such a good little leftist. What do you think of the debate?